AS A young man, I spent countless nights trying to develop a foolproof roulette system. I sat at a table, testing what seemed to me like plausible-sounding theory after plausible-sounding theory. Until, in each and every case, I noticed a small, sometimes almost imperceptible, but always fatal, flaw. The flaw usually hit me just at the moment when the pile of chips in front of me, which I had expected to grow, disappeared. Eventually I accepted - I wish I could tell you it was earlier than it was - that my search for a foolproof roulette system was proof only that I was a fool. My only consolation was that the tests had been conducted with a toy wheel on my dining room table, and the plastic chips had represented nothing more valuable than plastic chips. Every bet placed before a roulette wheel begins to spin is a bad bet. Your prospects of winning are smaller than implied by your prospective winnings. Only slightly, but enough to ensure that, in the long run, you will lose and the casino will win. Every stake - most roulette systems are really only staking plans - is risked on a wager with a negative expectation. The only way you could win would be if you could predict, when the wheel began to spin but before "no more bets" was called, where the ball would land. Years later I heard of some American physicists who had developed a computer programme that could do just this. When they started to win, however, the casino owners became suspicious. And before long security men were ripping the concealed computer cords from their trousers. The search for a perfect betting system is a long and elusive one. And it is never really over. Because should you discover an infallible money-making method, the people from whom you are making money will realise what you are doing and find a way of stopping you doing it. Often this will consist of nothing more sophisticated than a refusal to accept any more of your bets. Last Thursday I met two men who have been enriching themselves for several years by backing lop-sided international football fixtures to finish 2-0. One of them showed me a 1998 betting slip on which the score paid out at odds of up to 18-1. He was trying not to smile and I was trying to conceal the steam coming out of my ears. I had met the men before and was aware that they had what seemed to be a profitable betting strategy, and that it involved internationals. Even at the end of a very long, beery evening, however, they would not tell me what it was. Over the years other punters have identified the same error, bookmakers have noticed and the odds began to tumble. Now profits have dwindled. The men will have to start all over again with something else. On a less exalted level, though over a much shorter timespan, the same thing happens when I identify what I think are errors in the way a spread betting market is being priced up and write about it in the Racing Post. The market-makers read what I have to say. If they think I am wrong, they carry on as before, happily profiting from my mistake. If they think I am right, they change the way they price up the market to the one that I suggested. And that opportunity for us to profit is gone. 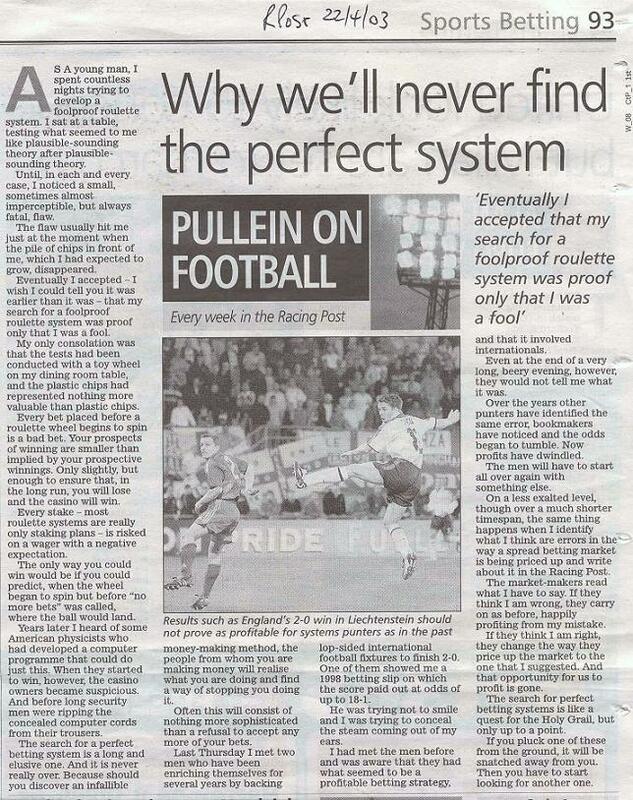 The search for perfect betting systems is like a quest for the Holy Grail, but only up to a point. If you pluck one of these from the ground, it will be snatched away from you. Then you have to start looking for another one.